Our version of the backwoods favorite, Still Pond’s Muscadine Moonshine is an 80 proof spirit produced from grapes and grain that’s been distilled 3 times. This moonshine has a smooth vanilla flavor up front with a good kick to finish. Double Barreled Moonshine, Still Pond Distillery’s original moonshine, has been barreled for a short amount of time in order to obtain color and oak flavor. A summertime favorite, Still Pond Distillery’s Peach Moonshine is great straight up or chilled with sweet tea! Still Pond 80 proof Vintners Vodka has been distilled 8-12 times to achieve superior smoothness and reach 190 proof prior to being cut with pure water drawn from the Floridian aquifer. Slightly flavorful bouquet. Filtered through activated carbon. Still Pond 99 Proof Vodka is the same quality and standards as the 80 proof, but with 49.5% alcohol. You may view our Vodka Certificate here. 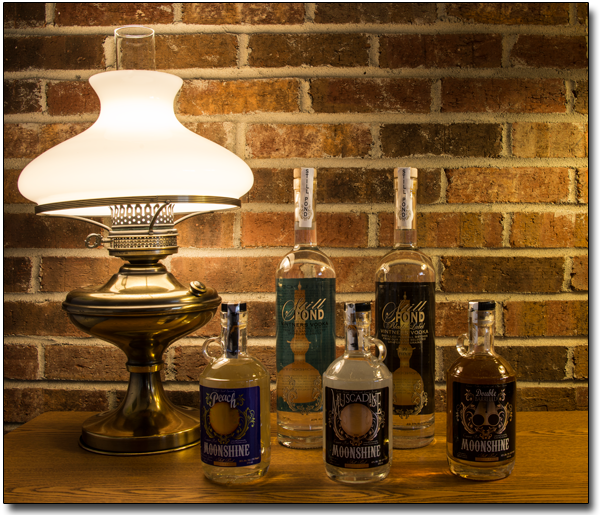 To find a spirits retailer near you please give us a call @ 1-800-475-1193.